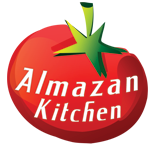 Wonderful nature, perfect summer day, 2 types of homemade cheese melt on fire for perfect raclette and put over special fried potato spirals made with AlmazanKitchen® special knife. It’s your turn to repeat! Very simple and amazingly delicious! Enjoy! Cut into a spiral using knife. Fill the pot with frying oil then place it on coals. Dip-fry the potato spiral skewers until crispy golden brown. Slice 100g of brie cheese and 150g of Gouda cheese then melt it together in the pan. Cover the potato spiral skewers in melted cheese. Finish off with handful of fresh chopped chives.